Since gaining independence from South Africa in 1990, Namibia has sought to rival its neighbor in terms of tourist appeal. While it hasn't yet gotten up to the numbers of South Africa, Namibia tourism sector has plenty to work with. The desert and mountainous areas represent a real source of appeal, with species of classic African game animals, such as desert lions, zebras, and elephants real highlights of safaris through the national parks. Namibians are rightly proud of their country, and the myriad traditional villages, colonial German towns, and lively urban centers all deserve your attention. Namibia is in Africa. 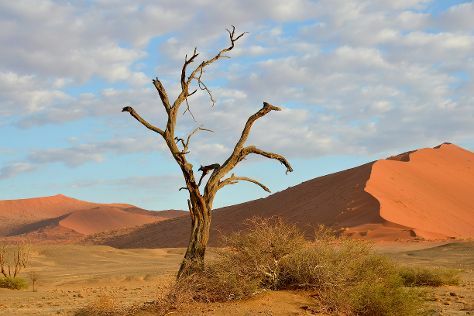 Use our Namibia trip planner: Namibia and all its delights await.